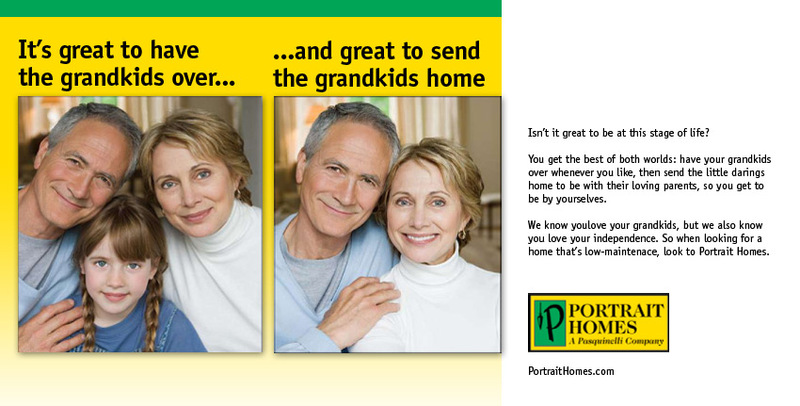 Portrait Homes was selling Ranch Condos to seniors and retirees and wanted to appeal to the more mature set. So we developed this ad that showed a hard reality: as much as grandparents love their grandkids, they're also happy to see them go! Simple and direct. Who says there no truth in advertising any more?! For those home builders looking for something a little different in a marketing firm in Columbus Ohio, look to us to bring a slightly different approach to your marketing. As a side note, while we're not Grandparents yet, we've come up with options for what we're gonna be called by our grandkids. For one of us it's a toss us between "G-Daddy" and "Faux Paw," and for the other, simply "Mrs. Sevell" or "Grand-Mamasito." Any other suggestions you may have, we're certainly open to them, so send them our way. See more of our home builder stuff here.